U.S. National Arboretum, Wash. D.C. The U.S. National Arboretum has introduced and distributed a unique group of elite color forms of Rhododendron kiusianum Makino, or, as it is known in Japan, "Miyama-Kirishima" for those rhododendron specialists interested in small-leaved azaleas. Through the efforts of Dr. John L Creech, Director Emeritus, and Mr. Sylvester G. March, Horticulturist, the National Arboretum has assembled a unique collection of 48 cultivars of this species. This group represents the largest number of Rhododendron kiusianum cultivars introduced into the United States for distribution to arboreta and the nursery trade. R. kiusianum is well known to the Japanese. This azalea is found exclusively on the mountain tops of Kyushu between 1300-1700m. elevation. The earliest work on Japanese azaleas, Kinshu Makura (Handbook of Azaleas), written by a Japanese nurseryman in 1692, includes several named selections of this beautiful azalea. One reason for the early discovery and identification of R. kiusianum was probably its location on Mt. Kirishima, one of the sacred mountains celebrated in Japanese mythology. Ernest Wilson writes in his work, A Monograph of Azaleas (1921), it was on Mt. Kirishima that the God Ninigi, grandson of the sun-goddess Amaterosa, touched down to pave the way for the conquest of Japan. This famous mountain location enabled R. kiusianum to be discovered and cultivated by zealous Japanese pilgrims, who visited Mt. Kirishima and were anxious to have a reminder of their pilgrimage. This practice of plant collection may explain why Ernest Wilson encountered R. kiusianum in a garden on May 5, 1918, and again on October 1, 1918, at the Province Osumi, Kirishima-jinga. It was the Russian botanist Maximowicz who first described R. kiusianum in the wild on Mt. Unzen in 1870. Maximowicz assumed it was a botanical form of R. indicum (L.) Sweet ( R. indicum var. amoenum f. japonicum Maxim). Wilson, however, preferred to include it in the R. obtusum series as R. obtusum f. japonicum (Maxim) Wils. The Japanese botanist Makino believed that R. kiusianum deserved a separate species designation. In 1917, he recorded R. kiusianum as a distinct species in the Journal of Japanese Botany . Most rhododendron experts have continued to recognize R. kiusianum as the proper species designation. The characteristics of R. kiusianum vary according to its geographical location and its hybridization with R. kaempferi Planchon. Normally, R. kaempferi is found between sea-level and 500m. and rarely above 800m. elevation, while R. kiusianum is found only in alpine meadows and volcanic areas between 1300-1700m. elevation. In the zone between 800m. and 1300m. elevation, a wide range of intermediate forms occur. 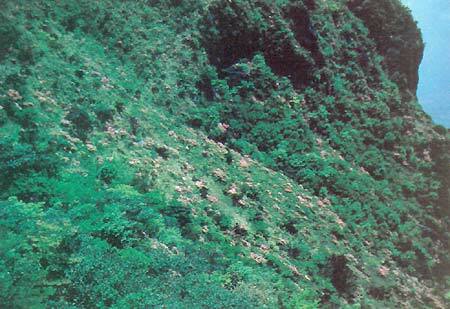 This fact is documented by Dr. Creech in his 1961 plant exploration account as follows: "In 1956, I had climbed to the rim of the volcanic cone Karakuni-dake (1700 meters) to observe the colonies of R. kiusianum , a small-leaved, purple-flowered azalea. When this azalea hybridizes with R. kaempferi from lower elevations, a bewildering array of seedlings with pink, scarlet, crimson, and purple flowers result." These intermediate forms led E.H. Wilson in 1918 to conclude that R. kiusianum and R. kaempferi should be classified as a single species, R. obtusum . In addition, Wilson believed that these hybrid forms were also the source of the Kurume azaleas. In his work Monograph of Azaleas , Wilson explains: "On visiting Nishi-Kirishima, where between 650-1500m. altitude this form Japonicum ( R. kiusianum ) grows in great abundance, and after seeing the wide range of color among the flowers, I am absolutely convinced that this Azalea is the wild parent of the race known as 'Kurume Azaleas'." It is generally considered that the high-elevation plants found above 1300 meters exhibit characteristics of the pure species. Dr. Jisaburo Ohwi, in his book. Flora of Japan (1965), described R. kiusianum as follows: "Brown strigose, low, much branched, often prostrate or decumbent shrub to 1 meter high; vernal leaves oblong to elliptic, 8-30 mm. long, acute at both ends, very short-petiolate, the summer leaves smaller, more or less persistent, narrowly obovate-spathulate; flowers 2-3, rose purple, terminal, in umbels; calyx-lobes 5, short, broadly ovate, 2-3 mm. long; corolla infundibuli-form, 2-3 cm. across, glabrous, 5 lobed, stamens 5, the filaments loosely granular-pilose on lower half or glabrous, the others often purplish; capsules ovoid, about 7mm. in diameter, the pedicels 5-8mm. long. May. High mountains; Kyushu". In recent years, we have become aware that the existence of many small, family operated specialty nurseries in Japan were threatened. As in the United States, the cost of land and production has created the need for mass production and mechanization. Unfortunately, for the plant specialists throughout the world, these small specialty nurseries may soon disappear. In 1976, with a grant from the Merrill Foundation, Dr. Creech, accompanied by Mr. Sylvester G. March, Chief Horticulturist of the National Arboretum, returned to Japan with the purpose of visiting these nurseries and collecting material of select Japanese garden plants. The material was collected for use in developing the National Arboretum's plant collections, as well as for propagation and distribution to arboreta, botanical gardens, and the nursery trade. On the southern island of Kyushu, they enlisted the services of Dr. Masaki Kunishige, then Ornamental Horticulturist of the Kurume Ornamental Crops Research Station, and T. Tamura, formerly of the Kurume Station, both experts on rhododendrons. They directed Dr. Creech's and Mr. March's attention to two small nurseries in Kyushu that specialized in the growing of R. kiusianum . (Color designations are taken from Nickerson Color Fan. Cultivars with limited descriptions have not been seen by the author). 'Fugennotsuki'-NA 40818. Flowers single, 2-2 cm. in diameter, deep purplish-red (5RP3/9) to moderate purplish-red (5RP4/10), light center of corolla tube, style red. 'Fizikomachi'-NA 40823. Flowers single, 1-2 cm. in diameter, flowers deep purplish-pink (5RP6/10) to moderate purplish-red (5RP5/10). 'Harunoumi'-NA 40815. Flowers single, 2-3 cm. in diameter, moderate purplish-red (5RP5/10) to deep purplish-pink (5RP6/10), filaments light pink. 'Maiogi'-NA 40826. Flowers single, 2-2 cm. in diameter, strong purplish-red (7.5RP4/11). 'Miyamakikoshi'-NA 40825. Flowers single, moderate purplish-red (5RP5/10). 'Miyamunokasumi'-NA 40820. Flowers single, 2-2 cm. in diameter, deep purplish-pink (5RP6/10) with lighter throat. 'Miyamamurasaki'-NA 40821. Flowers single, 2 cm. in diameter, strong reddish-purple, (2.5RP5/10-2.5RP4/10), red style. 'Otomegokoro'-NA 40817. Flowers single, 2 cm. in diameter, deep purplish-pink (7.5RP6/12) to strong purplish-red, (7.5RP5/12), style and filaments pink. Tenshi'-NA 40432. Flowers single, 2-3 cm. in diameter, deep purplish-pink (5RP6/10), lighter throat. 'Unzenzakura'-NA 40819. Flowers single, 2 cm. in diameter, strong purplish-pink (7.5RP7/10-5RP7/9). 'Zuiko'-NA 40814. Flowers single, 2 cm. in diameter, strong purplish-red (10RP4/12), red filaments. 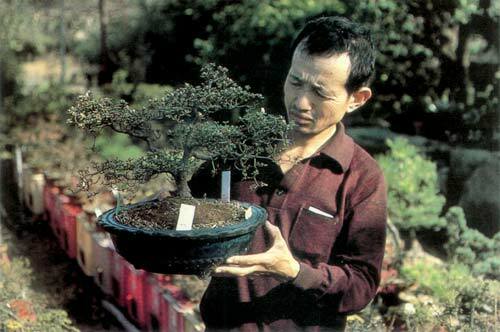 Mr. Kuratomi Jr. inspecting R. kiusianum trained as Bonsai. 'Benisuzume'-NA 40425. Red, large flowers. 'Benizakuru'-NA 40439. Pale pink, thick, long twig. 'Benizuru'-NA 40427. Pale red, single flowers. 'Ekubo'-NA 40449. Purple, single flowers. 'Fujimusume'-NA 40429. Flowers single, 2 cm. in diameter, light purplish-pink (5RP 8/5) to almost white. 'Hakutsuru'-NA 40420. Flowers single, 2-3 cm. in diameter, pure white with blotch. 'Haneotome'-NA 40442. Pale pink, small flowers. 'Hanekomachi'-NA 40426. Pale vermillion, small flowers. 'Hanshiro'-NA 4041. Flowers single, 2-2 cm. in diameter, pure white. 'Harunosato'-NA 40445. Rose, single flowers. 'Harunoyoi'-NA 40450. Flowers single, 2-2 cm. in diameter, deep purplish-pink (2.5RP6.10). 'Harusame'-NA 40438. Pale red/purple, single flowers. 'Hinazakura'-NA 40443. Pale pink, small flowers, open. 'Hinode'-NA 40424. Red, large flowers, long twig. 'Kiyohime'-NA 40422. Pale vermillion, large flowers, open slender twig. 'Kuroiwahaku'-IMA 40418. Small flowers, slender twig. 'Maioogi'-NA 40447. Rose purple, pale center, single flowers. 'Miyamanokasumi'-NA 40435. Pale lavender flowers, small flowers. 'Miyamanokatsura'-NA 40434. Purple, small flowers. 'Miyamashikibu'-NA 40431. Flowers single, 1-2 cm. in diameter, deep purplish-pink (5RP6/10) to moderate purplish-red (5RP4/10), style red. 'Miyamasusogo'-NA 40433. Flowers single, 2-3 cm. in diameter, deep purplish-red (7.5RP3/9-5RP3/9), style red. 'Sakon'-NA 40436. Flowers single, 2-2 cm. in diameter, moderate purplish-pink (2.5RP7/8) to deep purplish-pink (2.5RP6/10). 'Taisenhaku'-NA 40419. Flowers single, thick twig. 'Takochiko'-NA 40437. Flowers single, 2-3cm. in diameter, strong purplish-red (7.5RP5/12-7.5-RP4/11). 'Tatsuta'-NA 40423. Pale vermillion, large flowers, large twig. 'Tenshi'-NA 40432. Flowers single, 2-3 cm. in diameter, deep purplish-pink (5RP 6/10), lighter throat. 'Tsukushikomachi'-NA 40446. Rose, small flowers. 'Tsurumi'-NA 40428. Flowers single, 2-2 cm. in diameter, strong reddish-purple (2.5RP5/10), style bright red. 'Ukon'-NA 40444. Flowers single, 2-2 cm. in diameter, strong purplish-pink (7.5RP7/10) to deep purplish-pink style bright red (7.5RP6/12). 'Yabae'-NA 40441. Pink, small flowers, open twig. 'Yufuzakura'-NA 40440. Flowers single, 2 cm. in diameter, strong reddish-purplish (2.5RP4/10)to moderate purplish-red (5RP4/10), style red. 'Yuugiri'-NA 40448. Flowers single, 1-2 cm. in diameter, strong reddish-purple (2.5RP5/10-2.5RP-4/10), fades to light pale center, style red. 'Yuzuki'-NA 40430. Flowers single, 2 cm. in diameter, deep purplish-pink (2.5RP6/10) to strong reddish-purple (2.5RP5/10). All 48 acquisitions are now at the U.S. National Arboretum. According to Dr. Kunishige, R. kiusianum is found wild in several areas of Kyushu. It is his belief that most of the forms available from Japanese nurseries are from these locations. One area is Mt. Kuju, southeast of Kurume, the highest mountain on Kyushu where typical R. kiusianum is found. The second location is Mt. Unzen, southwest of Kurume on the Shimbara peninsula. Here the plants are taller growing than in the other areas of Kyushu. The third location is Mt. Hane-yama, located adjacent to Mt. Kuju. 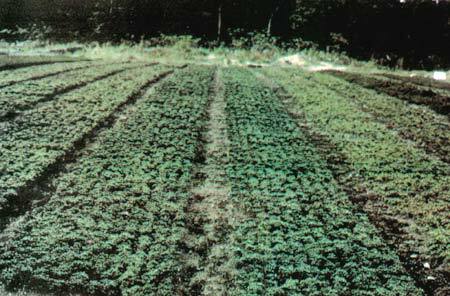 Most of the plants growing in this location are compact and vary in flower color. Dr. Kunishige attributes the variability of size and color to hybridization with Rhododendron kaempferi Planchon. R. kiusianum in flower at Mt. Unzen in late May. Rhododendron kiusianum and its cultivars are best considered alpine plants with specific requirements for successful culture. At the U.S. National Arboretum, there has been some difficulty growing these plants, possibly because of the humid summers with high night temperatures. They seem to decline during the hot, humid months of July and August. The areas most readily suited for growing these plants are the Pacific northwest, the southern Appalachian Highlands, and the cooler areas of the northeast U.S. north of Philadelphia. Soil is an important factor to consider for success in growing Rhododendron kiusianum . Where Rhododendron kiusianum is native, it grows on porous, volcanic soils, as a clue to the need for a well-drained, porous soil consisting of sand, gravel, or turface (a baked clay soil additive). An alternative method would be to plant in raised beds, with a light mulch, such as pine needles, hardwood bark mulch, or woodchips, always maintaining a porous, well-drained, and acidic soil with a pH 4.5-5.9. The Rhododendron kiusianum cultivars distributed by the U.S. National Arboretum are a novel addition among garden azaleas. This group represents a sampling of the many hybrids grown and enjoyed by the Japanese. They should appeal especially to rock garden enthusiasts, bonsai artists, and rhododendron specialists interested in small low-growing azaleas. Whether the gardener's need is for red, pink, purple, or even white, there is enough variety to satisfy all. Also of note is the natural dwarf compact stature of these plants that require no pruning. The fall and winter color of the foliage is a persistent dark bronze to yellow. In extremely cold areas where the leaves are deciduous, the loss of foliage will display the reddish-brown twigs and also the intricate branching habit of this splendid azalea. Creech, J.L. 1966. Ornamental Plant Explorations - Japan, 1961. ARS 34-75. U.S. Dept. of Agriculture. Lee, F.P. 1965. The Azalea Book . D. Van Nostrand Co., Inc. Princeton, New Jersey, pp. 171, 123. Wilson, E.H. & A. Makino, T. 1917. Journal of Japanese Botany . 1 (173) fig. D.C. Rehder. 1921. A Monograph of Azaleas . Harvard University Press, Cambridge, Massachusetts. 1921. pp. 33-41.